I drove all the way out to Kowee Creek last night, which considering our roads don’t reach to any other towns, is actually an impressively long drive. It’s also far enough from home that I’m relatively certain I’ve never hiked the trails along the creek’s banks. It could partially be the time of year (varying water levels), but Kowee Creek appears to be every bit as big as the Herbert and Eagle Rivers, which was a surprise to me. I was expecting and hoping for something much smaller (maybe if I hiked up-stream some), so I didn’t end up with many photographs. Even though I originally made the drive north to find somewhere it wasn’t raining, it only took the wetness about an hour to catch up with me. On the way home, I found this view of Eagle Beach, and it struck me a being so perfectly Juneau. 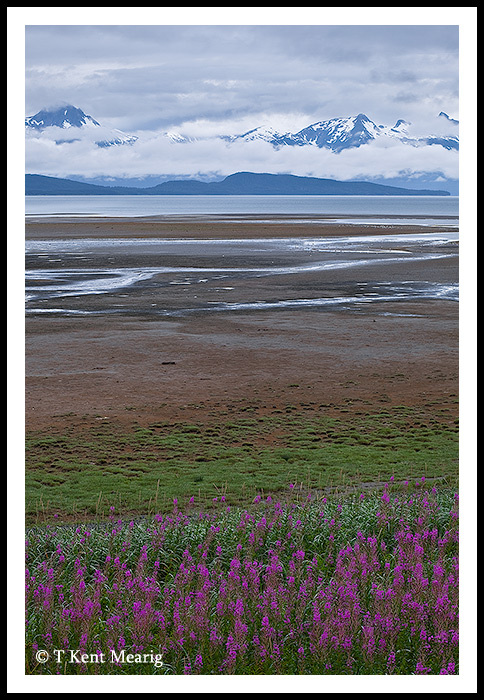 The big mountains (Chilkat Range), calm water, huge tides, fireweed everywhere you look, and especially the thick overcast show the essence of the coastal forest I’ve been loving to live in for the last seventeen years.